The Skye Combination was formed in about 1851 and comprised the 7 parishes of Bracadale, Duirnish, Kilmuir, Portree, Sleat, Snizort, Strath. In 1881, the parishes had a combined population of 17,797. The building, designed by Inverness architects Ross and Joass, was a typical T-shaped layout of the period, but believed originally to have been only one storey high. Males were accommodated at one side and females at the other. Administrative functions were located in the central portion together with kitchens and a dining-hall/chapel. Out-buildings included a laundry and a small mortuary. Skye poorhouse from south-west, 1920s. © H. van den Berg-Cameron. If the 1881 census is anything to go by, the poorhouse stood practically unused — of the six residents, three were staff and the remainder were described as "patients". In 1923, the average number of nightly inmates was three. The poorhouse was finally closed on 20 April 1924. 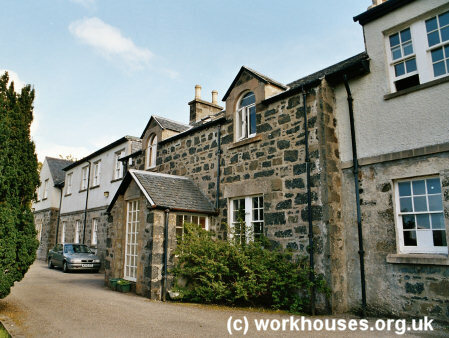 In 1933-4 the Carnegie Foundation set up four hostels to provide accommodation for children attending school in Portree and in Stornoway on Lewis. 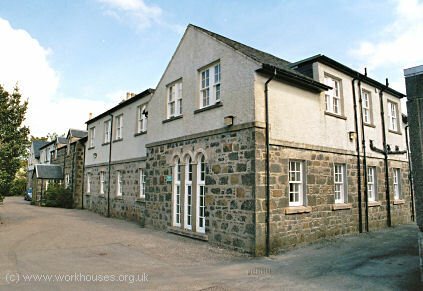 The former Skye poorhouse was taken over converted to become one of these. The ground floor was extended and a second storey was added. Skye main entrance from south-west, 2004. Skye main block from the north-east, 2004. Skye main block from south-west, 2004. The building is still used as a hostel by Portree High School. In 1893, a fever hospital known as the Ross Memorial Hospital was opened near to the poorhouse. After its closure, it lay derelict until being refurbished in 1996 as an arts centre. In addition to its participation in the Combination, from about 1883, the parish of Portree operated had its own poorhouse or almshouse. The establishment was administered by the Parochial Board rather than operating as a statutory poorhouse under the central Board of Supervision. 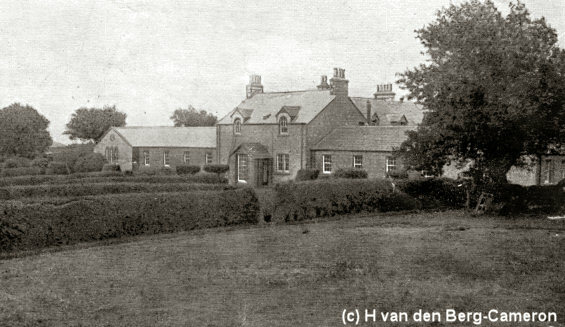 In 1904, the property, location unknown, was recorded as being able to house up to 6 men, 6 women, and 10 to 12 children. Highland Archive Service, Bught Road, Inverness IV3 5SS, Scotland. - Holdings: General Register of the Poor for Portree parish (1900-29).